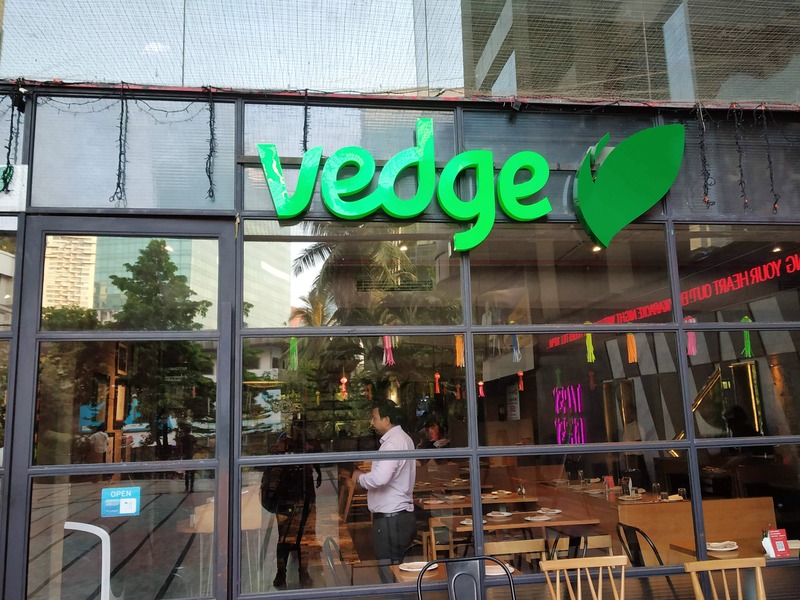 Vedge is one of the best Vegetarian places in Mumbai! Paan supari Martini:- One of the best martinis I've ever had. The paan flavour, the lovely taste and soothing feeling is certainly a lovely charm to the meal. FIZZ:- You can think of this drink as Kala khaata gola but in the form of a drink. It comes in a boot-shaped bottle.Loved this drink. I would definitely recommend it. Then we went on to starters. :- PANI PURI SHOTS:- Puris kept over shots glass containing the Panipuri water. Personally, I loved the concept, it helps the messy eaters and absolutely delicious. They got the balance of the Pani Puri really well so I was impressed. FULLY LOADED NACHOS:-This looked so beautiful when it arrived at our table.Nachos decorated beautifully in a scrumptious mixture of beans, cheese, veggies such as black olives, red bell peppers. It's good to eat this fast because of the cheese as it makes the nachos soggy. Tasted so yummy though, the cheese was just blending with other elements. PANEER CRISPY IN BLACK BEAN AND SESAME SAUCE: -This tasted so good, sauteed paneer in black bean and sesame sauce with some veggies such as red, yellow bell peppers and garnished with some spring onions. It tasted quite great and looked very tempting. CHOCOLATE MUD PIE:- This was made right in front of us!! I loved the process FIRST was the making the chocolate brownie into a mash with a spoon then a scoop of vanilla is added and mixed to it. Then some nuts, dark chocolate chips are added and mixed and finally one scoop of vanilla ice cream topped with chocolate sauce and a mint leaf for decoration. Tasted so damn good! INDIAN SIZZLER WITH COOKED VEGGIES, CARAMELIZED ONIONS AND VEGETABLE PATTIES:- This is the Indian version of the sizzler by replacing the noodles with vegetarian pulao and boiled veggies and caramelized onions and some paneer makhani gravy. The pulao was quite rich in taste. The patty was amazing. WOK TOSSED CHILLI PANEER BAO:- I have had many baos before hence I wouldn't call it the best but I would certainly congratulate for the great effort put in. The bread of the Bao was slightly sweet just as it needed and paneer was soft and cooked beautifully within the red sauce. My suggestion would be to add more veggies inside the pulao besides just corn. The gravy of the Indian sizzler was a bit on the salty side but the rice was rich enough to compensate for it.